When you think about working with wildlife, education probably isn’t the first thing that comes to mind. Most people think wildlife rehabilitation or zoos. I tried both of those things but neither of them felt quite right. I decided to try out the education side of things with an internship at Ohio Wildlife Center. It was everything I could have hoped for. I spent my summer teaching different groups of people, adults and children alike, all about wildlife, the mission of the center, and the animal ambassadors we had there. I also had the chance to work with kids during on site day camps. Just being able to see their interest in wildlife and help them learn more about it brought such a joy to me. I was so happy spending my days there. I came to know the staff and the resident animals very well and miss them dearly. The season is over now but you can bet I’ll be going back to volunteer. I may have chosen a career with few job opportunities but when you find something you’re this passionate about, you just have to go with it. Samantha wrote this blog post as an in class assignment for the agricultural communication 2367 writing course. All opinions are her own. Let me just first say, I’ve learned that if you’ve never had any experience with Greek Life, it’s hard to look from the outside and understand it, and if you are involved with Greek Life, it’s hard to explain what it really means in a concise definition. So as I try to explain to you these reasons, know that some feelings and emotions cannot be explained because they cannot be put into words. As I understand Greek Life is not for everyone, here are some reasons why joining my agricultural sorority recreated my passion for agricultural education. 1. Different Places, One Cause. Rural, urban, out of state, in state, we all came from different places. We were all raised differently with different experiences but we all have an interest in one thing: agriculture. These women have taught me how to become a better educator to all different people, not just people who grew up the same way I did. 2. Agriculture is not just about cows and plows. 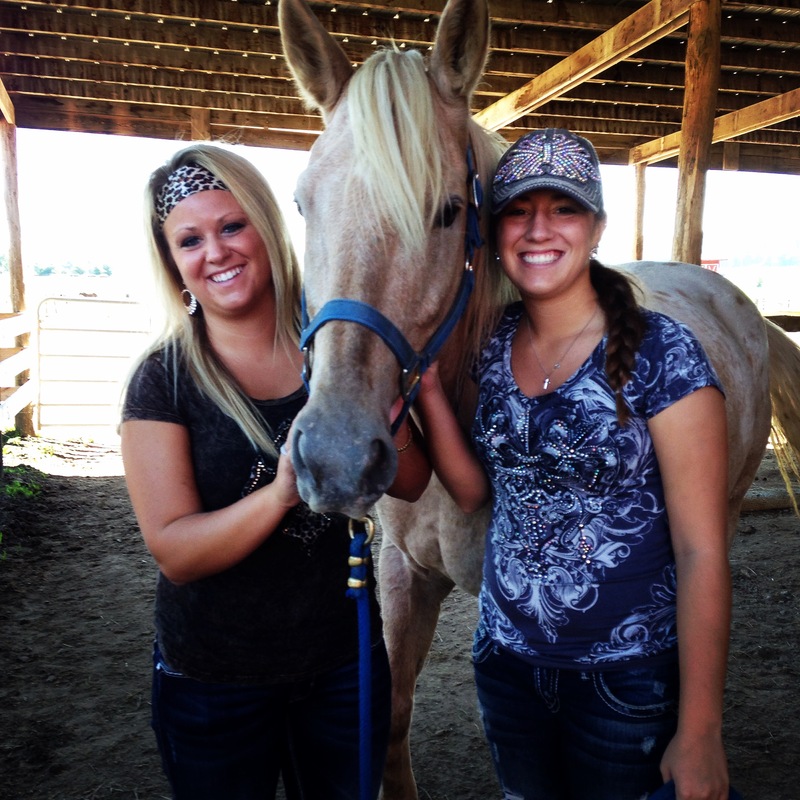 Although it can be easy to get caught up in teaching about livestock and crop production, the diversity of majors that come throughout my sorority have rejuvenated my ideas on what to teach in the classroom. Food science, agricultural communications, environmental sustainability, and agricultural economics are just a few aspects of agricultural that I now can teach in my future classroom. 3. Service never goes out of style. Even though we are required to have service hours every semester, the women in my sorority never cease to amaze me about their love to give back to the community. Whether that be volunteering at a pumpkin patch or doing activities for our philanthropies to FarmAid and the American Heart Association, I hope to instill that same initiative into my future program. Throughout my short time I’ve been a part of Alpha Sigma Upsilon, I have met some of the most amazing people. Getting to personally know every girl in my sorority, my network coming into college now has exponentially grown. I now will be able to call upon these women in the future and forever, as references for my teaching and for my students. I now have a whole network that many will never have the chance to receive, and I am grateful. Tricia and her Alpha Sigma Upsilon sisters. As someone who came into Greek Life so I could build my resume, I never thought my sorority would recreate my passion for agricultural education, and how I look at it. For that I am forever grateful and in debt to the women of Alpha Sigma Upsilon. 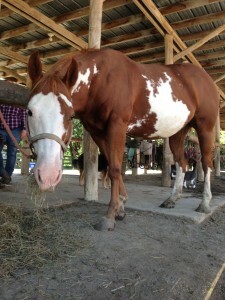 Tricia wrote this blog post as an in class assignment for the agricultural communication 2367 writing course. All opinions are her own. A little over a year ago I became a member of The Agricultural Education Society; the oldest student organization on campus. 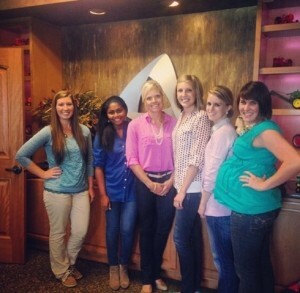 Not being an Agriscience Education major, I was very skeptical about joining this group. I had been warned numerous times through orientation, and peers to not become over involved or join organizations that take up too much time. However, joining Ag Ed Society helped acclimate me to college life and introduced me to lifelong friends. At my first meeting, officer applications were passed out and new members were encouraged to apply for committee chair roles. I, being ambitious, decided to take on a leadership role not knowing an abundant amount of information about the group. I applied for and received the position of fundraising chairman. 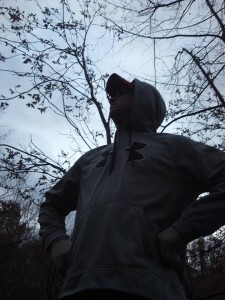 I was immediately given the task of coming up with fundraising events and implementing them. The society’s largest fundraiser of the year is working the Schmidt’s Sausage stand at Farm Science Review. Even though implementing this event would be simple for some, to me it was a struggle. I was in charge of finding students to work time slots, and cover all shifts. This tested my leadership skills in a way I was unfamiliar with. We were short on people, so I volunteered to work as many shifts as I could. The thought of driving to London, Ohio every day and serving food made me bitter. But once I got there, started working with the other students I was hooked. In those few short hours I had made friends that I knew would last a life time. We even did a cheer for Schmitt’s world famous cream puffs. It went along the lines of “We got cream puffs, yeah! We got cream puffs.” This was such an awesome opportunity where I was able to laugh and learn. 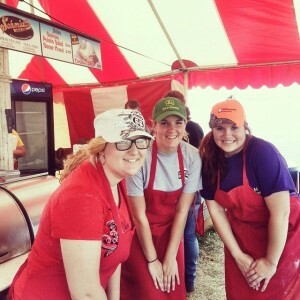 Miranda (orange hat) and two fellow Ag Ed Society members working at the Schmidt’s Sausage Stand at Farm Science Review. I never thought that a student organization would open the door to lifelong friendships and leadership opportunities. 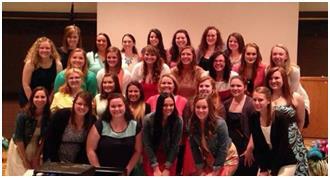 Through the meetings, service opportunities and social events, I have learned to call this organization my home. It’s the place that has truly made my love of agriculture grow and it has also made me certain that I want a career in this industry. 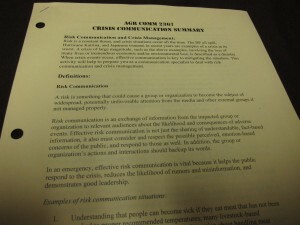 Miranda wrote this blog post as an in class assignment for the agricultural communication 2367 writing course. All opinions are her own. The men of Delta Theta Sigma (DTS) social/ professional agricultural fraternity once again this year ran the recycling program at Farm Science Review. We took the time as members to drive out there whenever we did not have class to pick up cardboard, aluminum cans, and plastic bottles. Recycling at Farm Science Review is one of the things that we do annually as community service. The amount of recycling that is picked up throughout a day is amazing to me. The men of DTS, pick up two to three of the huge dumpsters heaped over the top with recyclables. Also we go before the review starts in order to put up signs and bag all of the recycle cans. The cans are also in groups so we spread them out after we bag the cans. Then most of the time is spent driving around and checking the recycle cans and picking up card board sat out by the paths. I believe that this is one of the best community service projects that we do. 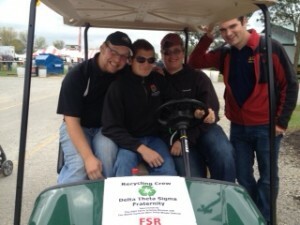 This not only helps the earth but it helps the earth through a farm show which also supports our focus as a fraternity. Craig (at the wheel) with three of his fraternity brothers. Two of the brothers are also agriscience education majors. Also the involvement of DTS does not end at Farm Science Review with recycling project, as we had three members in BLOCK for Agriscience Education. These gentlemen taught activities and gave tours at the natural resources area. We also have a member who works year round for Farm Science Review, working to get the grounds ready. 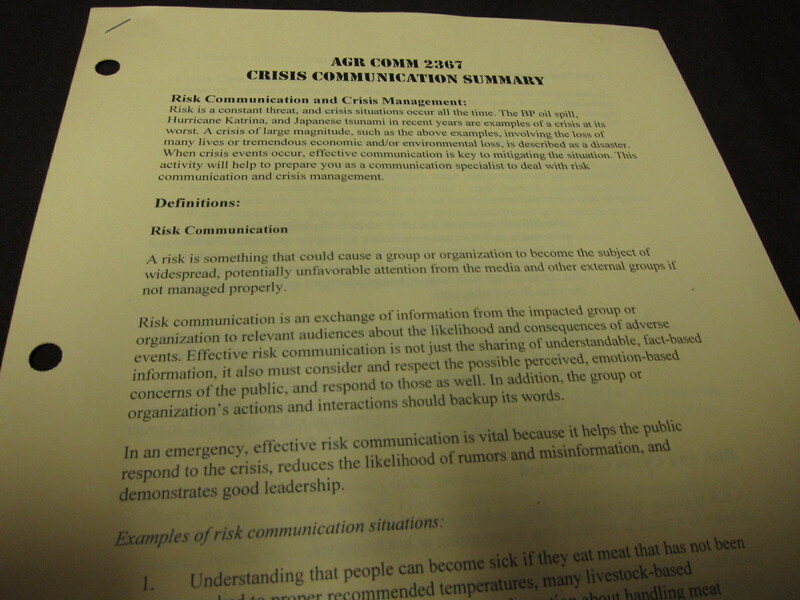 Craig wrote this blog post as an in class assignment for the agricultural communication 2367 writing course. All opinions are his own. As an arts management major at OSU, most of my classes have required me to go to art-related events at various galleries and museums around Columbus. But for an agricultural communication class I’m currently taking, I was required to go to a different type of venue; an agri-tourism site. 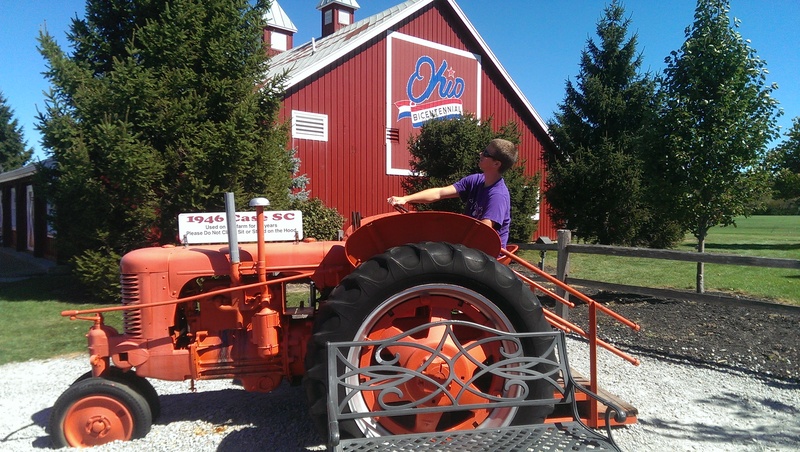 At the start of this assignment for AGRCOMM 2367, I didn’t even know what agri-tourism was, or that I already had some previous experience with the agri-tourism industry by shopping at local farmers’ markets in Hilliard or going on hay-rides with friends. So at the start of this agri-tourism assignment, I had no idea where I should go or what I should do. Luckily, a friend suggested that I check out The MAiZE at Little Darby Creek, and I’m extremely thankful that they did. The MAiZE at Little Darby Creek is a farm that is located in the beautiful, rural area of Milford Center (which is a few miles west of Plain City). The MAiZE at Little Darby Creek has a lot to offer, like hay-rides, berry-picking, a petting zoo, and even laser tag (which I unfortunately didn’t get a chance to play). 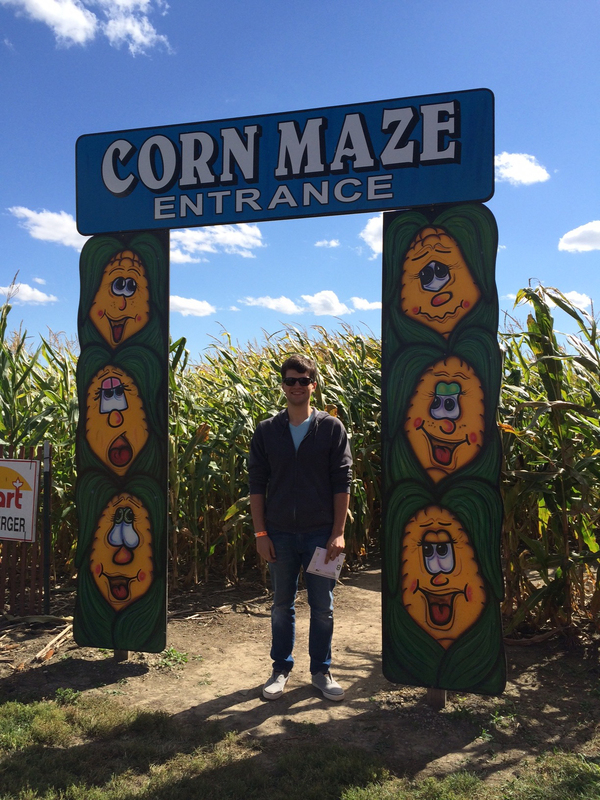 Their attraction that I was most excited about, though, was their 9-acre corn maze. The corn maze, which has been designed to resemble OSU’s Archie Griffin for this season, was a ton of fun to explore! 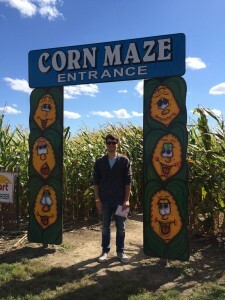 While the thought of wandering through a complex corn maze might sound daunting to the non-adventurous, the staff at the farm helps to mitigate this by putting up “Passport Stops” throughout the maze. Each Passport Stop corresponds with a slip of paper you pick out before entering the maze that essentially tests your knowledge in the area of trivia that you choose by asking a question, and if you answer the question correctly, the slip of paper will point you in the right direction. This made navigating the maze a lot easier than I thought it’d be, but if you don’t answer a question correctly at a Passport Stop, you might end up walking around in circles. Even with these Passport Stops to help me out, I still ended up getting lost for about thirty minutes or so, but it was still a great time. If you think that this sounds like fun, you should check out The MAiZE at Little Darby Creek’s website, www.mazeandberries.com. The farm has a ton to offer to city-dwellers such as myself, so if you’re bored on a weekend and want something fun to do, you should give it a shot. And since registration for classes is coming up, any OSU students who aren’t sure about which classes they should take for next semester should check out what is being offered by the Department of Agricultural Communication, Education, ; my experiences have been nothing but good so far. 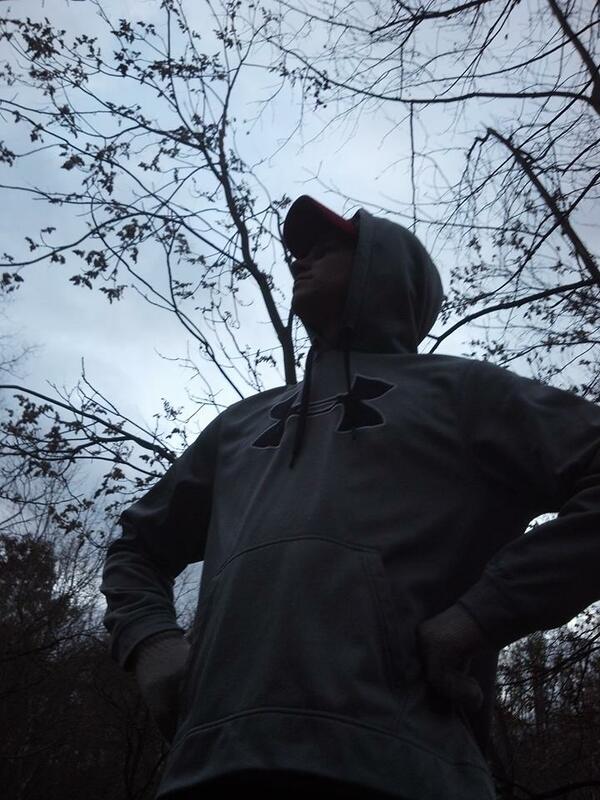 Konner wrote this blog post as part of an in class assignment for the agricultural communication 2367 class. All opinions are his own.